﻿ I have been all over the internet looking to see what Chanel is going to come up with for Summer 2012. What seems to be the best kept secret has finally been revealed. I finally found some pictures of the collection, but before I posted them I wanted to make sure the information was not a hoax. Although, the Chanel website has not posted any information about the new collection, there have been some pictures of the new collection floating around the internet. 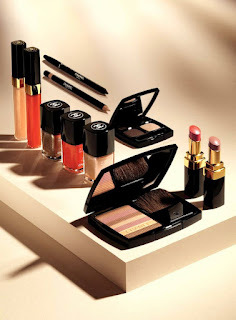 According to Pixiwoo and a few other websites, Chanel will launch their summer 2012 collection in May 2012 and it will take on inspirations from the natural sand and spice shades. Stated in the article, the Luminous Bronzing Powder will be available in two colors of either pink or peach based tones and contain seven silk textured tones within each palette. After looking at some of the pictures, I can see myself using some of the colors for eye shadows or maybe as a highlight rather than a bronzer. According to the famous makeup artists, the peach based palette will probably be more suitable for warmer skin tones and the pink based palette for cooler skin tones. It looks as if Chanel has created one eye palette duo, containing a natural beige and chocolate brown which will make all the natural eye shadow lovers happy (me included). According to Pixiwoo, "the duo could be used for a day or evening soft smoky eye". In addition, there will be a peach kohl pencil to compliment the eye shadows. Being of a deeper skin tone, I can only see myself using the peach kohl pencil on my waterline to give the appearance of an opened, bright eye effect. There will also be 4 glosses that look to be very sheer, excluding the peach gloss, and two lipsticks. Per reports, the glosses will have a tint of color that creates a high mirror shine. Included in the collection are three nail polishes in a soft beige, bronze and satsuma orange. The collection looks to be very subtle and versatile, hues that can be worn for work, play or special occasion. Personally, I am looking forward to trying the bronzing powder and the eye shadow duo, but I will keep an opened mind for the rest of the collection. To read more on the collection go to the Pixiwoo website.